Editor's Note: Haven Pell spent several months traveling the country on a "Skihad." This article is the third story about his journey. To stay in the correct geographic order and follow the first two Skihad episodes found elsewhere on Smerconish.com, I should describe the drive from Columbus, Ohio to Moline, Illinois, during which my eyes wandered from the trucks sharing the road with me to the adjacent farms. Pro Tip: if you see the word “should,” be ready for whatever you think is going to happen to be exactly what doesn’t. Agricultural acumen is not a strength of mine. Except for an unusual number of years in Europe, the majority of my life has been spent within a day’s bicycle ride of the Atlantic Ocean. There were, however, five years in Omaha, Nebraska that might have done something to alleviate this deficiency. It was there, in the summer of 1973, that I was introduced to the soybean. I was 27 and I am pretty sure I had never heard of a soybean before and absolutely sure I had never thought about soybeans. For current readers, tofu did not exist, at least in its current trendy form, and sushi with wasabi drenched in soy sauce was still years away. I met the soybean while in the passenger seat of a Plymouth on the way from Omaha to Grand Island. I suspect there are countless tales of bad things happening in the passenger seats of Plymouths but my introduction to the soybean is somewhere on that list. How was I to know that the driver of the Plymouth was entirely unqualified to tell me anything about the plants growing in the fields beside Interstate 80, which might or might not have been soybeans at all? To be fair, he was excellent at teaching me about his mother’s challah when we stopped at the house where he grew up in Lincoln. Clearly I thought of myself then and, to some extent, now as agriculturally challenged though technically I grew up on a farm. A tenant farmer grew corn (the tall things) and potatoes (the ones in the ground) on my grandfather’s land in a now fully McMansioned part of the north shore of Long Island. The choice was polo fields, and he got $100 per year from the farmer. Other than building forts with the vegetable crates, I had nothing whatever to do with these agricultural activities. 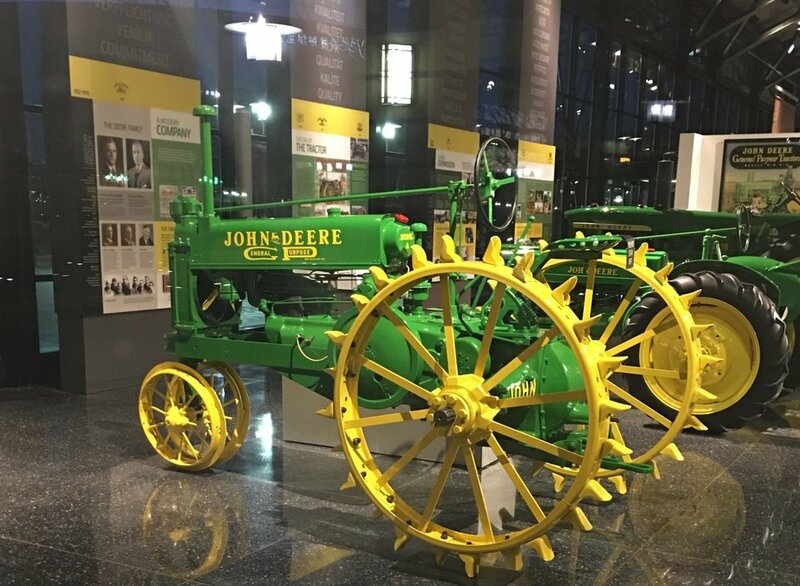 Curiosity about this life-long deficiency was the reason for the stop in Moline, Illinois, the home of the John Deere Harvester Works, the largest “Combine” (emphasis on the first syllable) factory on earth. For my fellow easterners, combines are used to harvest things and the name is derived from the machines being able to combine (emphasis on the second syllable) several different harvesting functions. John Deere is very good at making combines for all sorts of crops, and touring the factory to see them made is a real treat (more on that in the next episode). There have been humans for almost eight million years, but farming did not begin until ten to twelve thousand years ago. In the United States of 1800, 83% of the labor force was in agriculture. Presumably, that meant pretty much everyone who wasn’t farming was writing Constitutions, hunting down witches or founding Ivy League colleges. By 1820, there were 50 farmers for every transportation worker, 20 for every service worker and more than 25 for every manufacturing worker. By 1860, farmers out numbered transportation or service workers by only eight to one and manufacturing workers by less than four to one. After the Civil War about half the American workforce was in agriculture but today it is one in 50. Today, the sales of Apple Inc. exceed the output of the nation’s farms by $229 billion to $137 billion, though food as a whole, with nearly a trillion dollars of contribution to GDP, clocks in at more than four times Apple’s sales. That said, agriculture is a massive business and it dominates pretty much everything from eastern Ohio to the 100th meridian (Cozad, Nebraska) where the water supply effectively runs out and range land begins. When you hear the words, “flyover” or “square” states, usually spoken by east coasters, think farm country. Ancient maps did not actually include the words “here be dragons” on the uncharted territory, but the words “here be deplorables” are a pretty good description of the eastern view of the 1000 miles from eastern Ohio to Cozad -- especially among politicians who do not expect to win many votes there. You might not expect to find free traders in the heartland but when China threatens to impose tariffs on soybeans – a major American export – in retaliation for the President’s proposed tariffs on steel and aluminum, farm country conversations begin to sound like gatherings of international economists. Thanks to massive increases in productivity, the United States not only feeds itself but exports significant quantities of food to other countries. It does so with fewer and fewer farmers and larger and larger farms. This trend is not necessarily a healthy one for the towns that exist to support the farms. If a critical mass of people is required to support a high school, a car dealer or a grocery store, what do you suppose happens when that critical mass of school children, car buyers and grocery shoppers is no longer needed to farm the surrounding acreage? Declining population is not a pretty sight. We coastal dwellers might not fully understand what farmers complain about and we might even tire of the complaining about the challenges they face, but we had better hope farmers keep on doing what they are doing lest their work be left to those who think of corn as the tall things, potatoes as the things in the ground and think nothing at all about soybeans. I doubt even politicians would call farmers deplorable if there weren’t any.